I don't have a photo of the Amazing Book Lady of 1977 in Phoenix, Arizona. But I can still see her in my mind. She was elderly at the time, so if she's still alive and well today, I wish her well. The Amazing Book Lady lived in the apartment next to mine in the Saguaro Apartments, which were (and are, although the name has changed) at 4205 N. 9th Street. That is, 9th Street just north of Indian School Road, near Lopers. They were "furnished studios", which means that they were very inexpensive, and easy to move into. I was 19 and it was fine for me - just one room really, with a half-wall partition and a single bed. The furniture, of course, was revolting, and looked as if it may have been on Noah's Ark, but hey, I was 19, and living on my own, so I didn't mind. The price was right. The Amazing Book Lady was a retired teacher. Looking back now it seems kinda sad that she was in that ratty little apartment complex at that time in her life, but I never gave it a second thought at the time. And she had apparently been there for a long time, because I can remember that her apartment was crowded to bursting point, with books. There were bookshelves on every wall, and there must have been hundreds of books there. She invited me in there, and I remember that some of the other young people who lived nearby wondered what I was doing, as if it were some "Harold and Maude" thing? But the Amazing Book Lady just reminded me of all of the wonderful people I've known all of my life who have recommended books. She lent me a lot of books when I lived there. 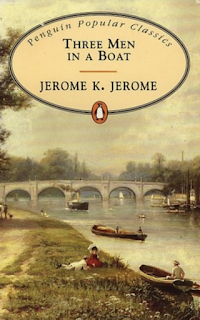 I had learned at an early age to at least try to start a book by reading the first few pages, and if I didn't like it, to set it aside, no hard feelings. 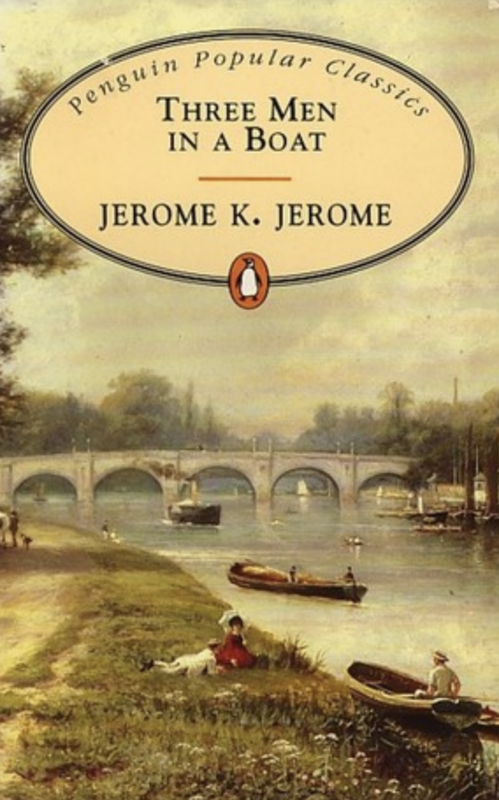 And the book that she introduced me to, which is still my favorite book of all time, was Jerome K. Jerome's 1889 "Three Men in a Boat". I've bought many copies of that book in my lifetime, and always brought it with me whenever I traveled. I still have a couple of copies sitting around here in my house, and I also have two versions of it as an audiobook, one read by Hugh Laurie, the other by Martin Jarvis, both excellent voice actors. In a long life I've learned that I have an unusual fascination for books, and a ravenous appetite. I'm always looking for suggestions, and I very often hear people say, "Books? Nah, I don't read much... back in school they made me read books..." And then I know that I need to change the subject. I'm about halfway through "Three Men in a Boat", which I'm sure I've read, and listened to, more times than I can count. And it's all because of the Amazing Book Lady. I can hear her crackling voice, I can see her smile, as she lent me that book for the first time and described it as an "ice cream cone". It is.